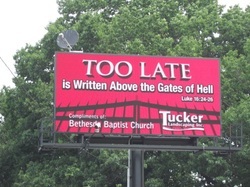 Pictures of the billboard that Bethesda has been posting messages on are now available online. Currently displayed at the corner of Northfield Road and Union Street in Bedford, Ohio. ﻿There's plenty to do to get the Word of the Lord out to a lost world. ...The harvest truly is plenteous, but the labourers are few;"